Which mother doesn't love her son's doodles? I definitely am such a mama. So I decided to have a little bit of early mother's day fun with the boys so I could show you this DIY idea. 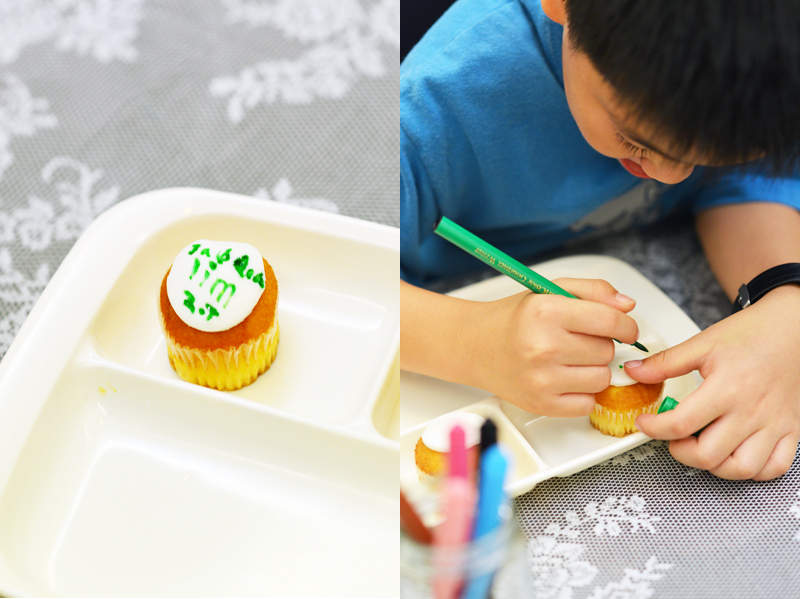 Essentially, I turned little cupcakes into canvases for my kids to doodle on by laying a circle of white fondant on top of each cupcake. You can bake the cupcakes yourself or just buy some off the shelf. Then hand it over to them to decorate with these food decorating pens. You can find directions on how to handle white fondant in this Cake Decorating with Alphabet Pasta post. I used mini cupcakes so there wasn't a lot of space for drawing. So if you wanted to give them more room to let their imagination go free, a bigger cupcake would work better. My younger son was so eager to eat the cupcake, he chomped it down before I could take a photo. This is one craft that can disappear down their stomachs so you have to be quick with a camera if you want to snap a pic for your album. My older son tried decorating quite a few because it does take a while to get a hang of the way the pen works. And he had fun. They were very eager to start on the craft because they love drawing and they love cupcakes and I think it was that perfect match made in heaven. Rolling the fondant and cutting the circles took me about 30 mins and then the kids were able to dabble in some cupcake decorating fun. It was really a lot of fun and I hope you will try it. p.s. If you aren't a mum or don't think your mum would appreciate it, this might also make a fun party activity. Happy decorating!